Volkssports has its own language. Here are some common questions and explanations. What should I do if I want to go on a walk? Traditional Events are European-style walks, conducted on one or two pre-scheduled days, often in conjunction with a community festival. The sponsoring club marks a 10 kilometer (6.2 mile) trail and provides check-points along the way. It’s a wonderful group activity where you will meet all kinds of other walkers traveling the same course. Since there is no competition, you walk at your own speed. In the U.S., walks usually start between 9:00 am and 12:00 pm and must be completed by 3:00 pm. Traditional events often have a 5 kilometer (3.1 mile) route available for people new to Volkswalking or with physical limitations. Awards and hat pins are sometimes commissioned for the event. Year-Round Events (YREs) are an American variation on the sport. 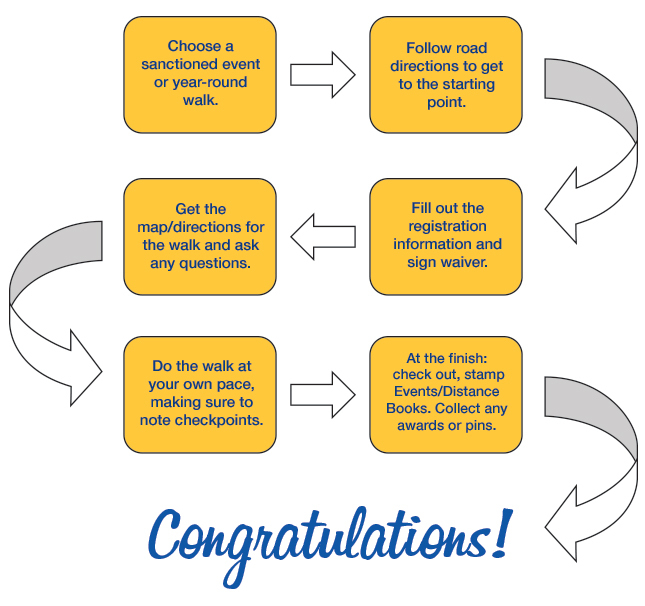 These self-guided courses have a designated start point with a start box for registration and walk directions. Different host clubs handle their sites and registration materials in different ways. If you are new to Volkswalking, the best way to experience a year-round event is to go with someone from the local club. Typical year-round events start in a public place (like grocery stores, hospitals, or convenience stores), where you find a registration sheet and trail map. Once you are familiar with how year-round events work, you can walk with yourself, a friend or in a group. Some events are Seasonal Events rather than Year-Round and are in operation only part of the year. Walks are open to everyone and free of charge, whether or not you belong to a Volkswalking club. The International Federation of Popular Sports (IVV) supports a recognition program for walkers who choose to record the events and distances they walk. You can purchase both event and distance books at most Traditional Events or check with your local club. There are different books for varying levels of achievement. New member packets are also available and contain a set of books at a special discounted price to help get you started. Then, every time you go to an event you pay a small fee and when you have completed the event, you receive a stamp. Should I bring water or snacks with me? You should ask about the availability of water fountains along the trail before starting. It is a good idea to bring your own (filled) water bottle along to ensure you won’t go thirsty along the trail. Checkpoints will often have hard candies or pretzels. Some start points also sell food. Bring snacks if you think you will get hungry. If you have any health problems, consult with your physician to determine how you should prepare for a two-hour or 10k walk (the longest usual distance). You should ask about the availability of restrooms along the trail before starting; although, these are usually designated on the route map. What sort of gear should I bring? If you are new to walking you may need to make sure that you have footwear that will support your feet over a 10 kilometer (6.2 mile) walk. Wear comfortable walking shoes you have already broken in. Dress for the weather. Layers are always a good idea – you will probably warm up once on the trail, but may want a jacket or umbrella. What is an “Event Book”? An Event Book is a folded card in which you record (via stamp) the number of events you have completed. You receive one stamp per event, regardless of how many times you walk the course. What is a “Distance Book”? A Distance Book is also a folded card in which you record (again via stamp) the event distances you complete – in terms of kilometers walked. Even though you receive only one event credit per course, you can still accumulate distance credit by walking the same trail more than once. Once you complete your event and distance books, simply send them to the American Volkssport Association (AVA). In return, you receive a certificate, patch and pin. Are the walks and trails rated for difficulty? Very small hills or very little stair climbing. Probably suitable for strollers and wheelchairs. Cumulative elevation gain from starting point: up to 200 feet. Some moderate hills and stair climbing. Probably suitable for strollers. May not be suitable for wheelchairs. Cumulative elevation gain from starting point: 200 – 1,000 feet. Some significant hill or stair climbing. Not suitable for strollers or wheelchairs. Cumulative elevation gain from starting point: 1,000 – 2,000 feet. Lots of significant hills or stair climbing. Cumulative elevation gain from starting point: 2,000 – 3,500 feet. Many steep hills. Cumulative elevation gain from starting point: more than 3,500 feet. A route with moderate hills on well-groomed trails would be rated a 2B.